I got an e-mail from one of my lovely long-time readers, Nikki, saying that she's a designer and she'd love to make me something. When I saw her Etsy shop I fell in love right away. 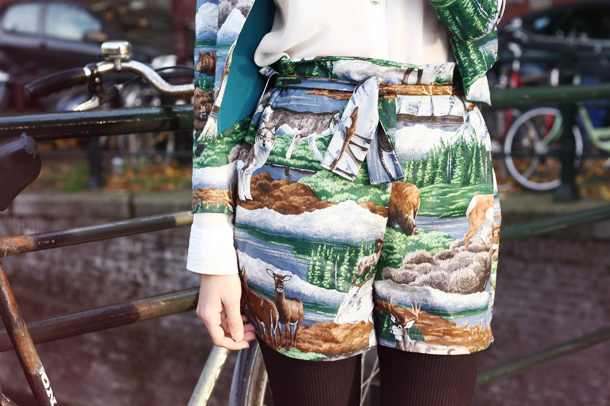 I really wanted this 'Call of the Wild' jacket, but I'd been looking for a perfect printed suit forever so I asked Nikki if she could make some shorts to go with it. Super happy with the result! Geweldige print, 't staat je echt mooi! I love the print on this design. I love finding fabrics that aren't immediately what you think to wear, but once you make something it totally makes sense. that print is crazy! in the coolest way possible! This shorts suit is definitely the best thing ever! The pattern is quirky and fun and it looks adorable on you. The print on your suit is so cute! Quirky and totally unique. Wow, this is amazing! What a beautiful fabric. You look so great. Cool prints. You are so awesome to pull off this look. 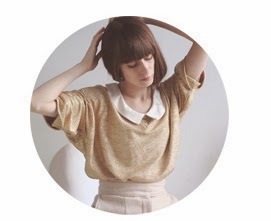 First sight on your blog, already fallen in love with this look! 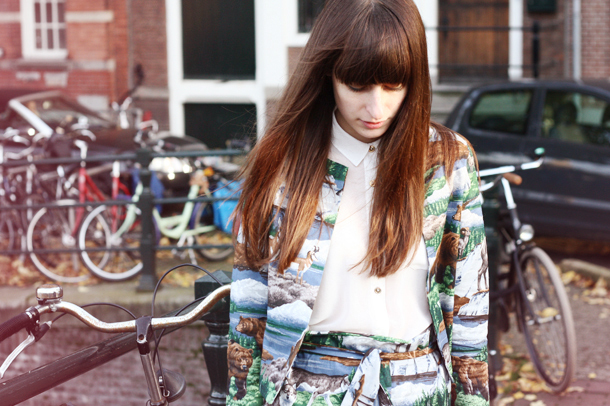 This suit is amazing, very "Carven" like. This is a grate look. wow i love the graphic print!! So cool she made the suit, what a talant! No way! Dit is absoluut het schattigste jasje ooit! Love the print! holy hell, this is AMAZING. i'm so in love with your style, newest follower!